One year after the Kickstarter campaign began, and eight months into beta testing, War of Conquest will be coming to Steam Early Access next Thursday, September 20th! 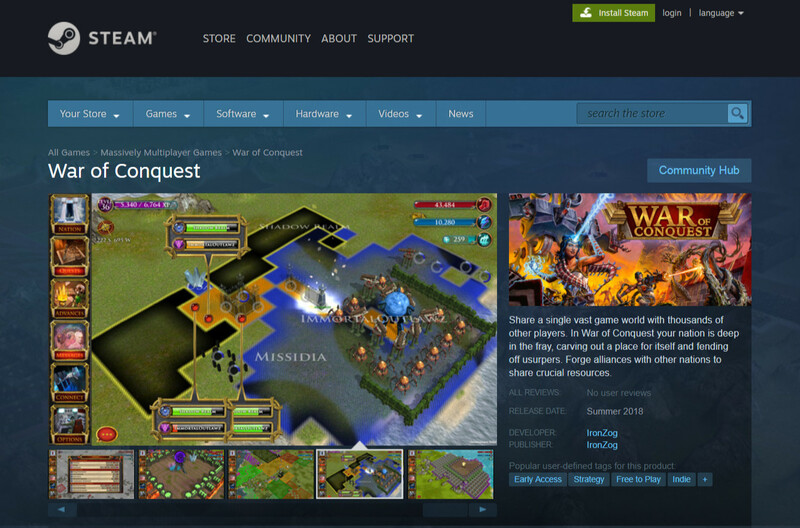 If you have a Steam account you can add War of Conquest to your “wish list” to be notified as soon as it launches. The new Steam client is similar to the client that can be downloaded through warofconquest.com, with a few exceptions: updates will download quickly and automatically, since Steam has a system for just updating those parts of the client that have changed; you’ll be able to use your Steam Wallet to buy credits; and the player guide can be accessed without leaving the game. Availability on Steam is expected to bring an influx of new players, which will both make the game experience much richer, and help expose any remaining bugs and design issues. After a few months of Early Access, the game should be ready for its official release: first on PC, with Android and iOS soon to follow. If you haven’t checked out the beta yet, or tried it out earlier in development, the Early Access launch would be a great time to drop in. Some major new features have been added in the past several months, including a matchmaking mode and weekly tournament, and the infusion of new players will bring a whole new dynamic to the game!